In January I made my first visit to Iceland in preparation for the winter workshop I’ll be doing there with Don Smith next January. And after a lifetime spent in the middle latitudes, one thing that was impossible to ignore was the quality of the winter light at 65º (-ish) latitude. Not only do sunrises and sunset last forever, but during our entire visit the sun never rose higher than 8º above the horizon. This got me thinking about light in general, and how we sometimes take it for granted. Or, if we don’t exactly take light for granted, how we often don’t take the time understand this thing that makes or breaks us. So I dusted off an article I wrote several years ago, updated the information there, and added some new images. You’ll find the story of this Iceland sunrise toward the bottom, just above the gallery. Photograph: “Photo” comes from phos, the Greek word for light; “graph” is from graphos, the Greek word for write. And that’s pretty much what photographers do: Write with light. Because we have no control over the sun, nature photographers spend a lot of time hoping for “good” light and cursing “bad” light—despite the fact that there is no universal definition of “good” and “bad” light. Before embracing someone else’s good/bad light labels, let me offer that I (and most other serious photographers) could probably show you an image that defies any label you’ve heard. The best definition of good light is light that allows us to do what we want to do; bad light is light that prevents us from doing what we want to do. Studio photographers’ complete control of the light that illuminates their subjects is a true art that allows them to create their own “good” light. 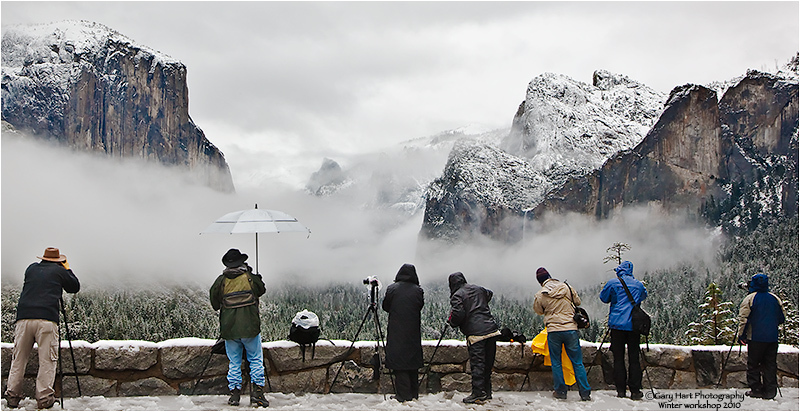 Nature photographers, on the other hand, rely on sunlight and don’t have that control. But knowledge is power: The better we understand light—what it is, what it does, and why/how it does it—the better we can anticipate the light we seek, and deal with the light we encounter. Energy generated by the sun bathes Earth in continuous electromagnetic radiation, its wavelengths ranging from extremely short to extremely long (how’s that for specific?). Among the broad spectrum of electromagnetic solar energy we receive are ultraviolet rays that burn our skin (10-400 nanometers), infrared waves that warm our atmosphere (700 nanometers to 1 millimeter), and the visible spectrum—the very narrow range of wavelengths between ultraviolet and infrared that the human eye sees, in the wavelength range between 400 and 700 nanometers. When all visible wavelengths are present, we perceive the light as white (colorless). But when light interacts with an object, the object absorbs or scatters the light’s wavelengths. The amount and wavelengths of light that’s scattered or absorbed is determined by properties of the object. For example, when light strikes a tree, characteristics of the tree determine which of its wavelengths are absorbed, and the wavelengths not absorbed are scattered. Our eyes capture these scattered wavelengths and send that information to our brains, which translates it into a color. When light strikes a mountain lake, some is absorbed by the water, allowing us to see the water. Some light bounces back to the atmosphere to create a reflection. The light that isn’t absorbed or reflected by the water light passes through to the lakebed and we see whatever is on the lake’s bottom. This vivid sunrise was reflected by the glassy surface of Mono Lake, but just enough light made it through to reveal the outline of submerged tufa fragments on the lake bed. For evidence of light’s colors, look no farther than the rainbow. Because light slows when it passes through water, but shorter wavelengths slow more than longer wavelengths, water refracts (bends) light. A single beam of white light (light with an evenly distributed array of the entire visible spectrum) entering a raindrop separates and spreads into its component colors. When this separated light strikes the back of the raindrop, some of it reflects: A rainbow! When sunlight reaches Earth, the relatively small nitrogen and oxygen molecules that are most prevalent in our atmosphere scatter its shorter wavelengths (violet and blue) first, turning the sky overhead (the most direct path to our eyes) blue. The longer wavelengths (orange and red) don’t scatter as easily and travel through more atmosphere—while our midday sky is blue, these long wavelengths are coloring the sunset sky of someone to the east. In the mountains sunlight has passed through even less atmosphere and the sky appears even more blue than it does at sea level. On the other hand, when relatively large pollution and dust molecules are present, all the wavelengths (colors) scatter, resulting in a murky, less colorful sky (picture what happens when your toddler mixes all the paints in her watercolor set). Most photographers (myself included) find homogeneous blue sky boring. Additionally, when the sun is overhead, bright highlights and deep shadows create contrast that cameras struggle to handle. Remember the blue light that scattered to color our midday sky? The longer orange and red wavelengths that didn’t scatter overhead, continued on. As the Earth rotates, eventually our location reaches the point where the sun is low and the sunlight that reaches us has had to fight its way through so much atmosphere that it’s been stripped of all blueness, leaving only its longest wavelengths to paint our sunrise/sunset sky shades of orange and red. When I evaluate a scene for sunrise/sunset color potential, I look for an opening on the horizon for the sunlight to pass through, pristine air (such as the clean air immediately after a rain) that won’t muddy the color, and clouds overhead and opposite the sun, to catch the color. Sunny days are generally no fun for nature photographers. 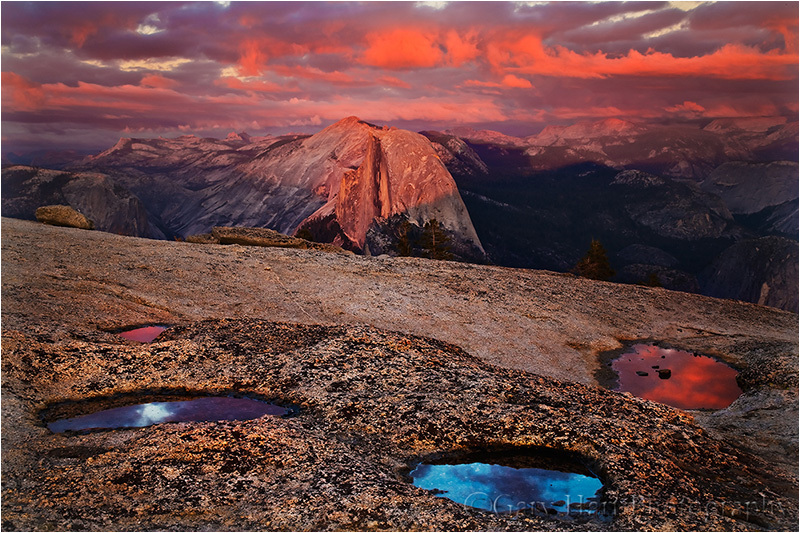 In full sunlight, direct light mixed with dark shadows often forces nature photographers to choose between exposing for the highlights or the shadows (or to resort to multi-image blending). So when the sun is high, I generally hope for clouds or look for shade. Clouds diffuse the omni-directional sunlight—instead of originating from a single point, overcast light is spread evenly across the sky, filling shadows and painting the entire landscape in diffuse light. Similarly, whether caused by a single tree or a towering mountain, all shadow light is indirect. While the entire scene may be darker, the contrast range in shade is easily handled by a camera. Flat gray sky or deep shade may appear dull and boring, but it’s usually the best light for midday photography. When skies are overcast, I can photograph all day—rather than seeking sweeping landscapes, in this light I tend to look for more intimate scenes that don’t include the sky. And when the midday sun shines bright, I try to find subjects in full shade. Overcast and shade is also the best light for blurring water. Another option for midday light is high-key photography that uses the overexposed sky as a brilliant background. Putting a backlit subject against the bright sky, I simply meter on my subject and blow out the sky. Whether I’m traveling to a photo shoot, or looking for something near home, my decisions are always based on getting myself there when the conditions are best. For example, in Yosemite I generally prefer sunset because that’s when Yosemite Valley’s most photogenic features get late, warm light; Mt. Whitney, on the other side of the Sierra, gets its best light at sunrise; and I’ll only the lush redwood forests along the California coast in rain or fog. Though I plan obsessively to get myself in the right place at the right time, sometimes Nature throws a curve, just to remind me (it seems) not to get so locked in on my subject and the general tendencies of its light that I fail to recognize the best light at that moment. If I drive to Yosemite for sunset light on Half Dome and am met with thick overcast, I don’t insist on photographing Half Dome. Instead, I detour some of my favorite deep forest spots, like Fern Spring or Bridalveil Creek. Other times finding the best light is simply a matter of turning around and looking the other direction. Mono Lake is one of those places that reminds me to keep my head on a constant swivel, or risk getting so caught up on the sunrise in front of me that I miss the rainbow behind me. Don Smith and I were here in January, scouting for our 2020 Iceland Winter Sights and Northern Lights photo workshop. Hiring a local guide to show us around, we gave him complete autonomy over our schedule (and even if we did know enough about Iceland to tell him what we wanted to see, we couldn’t have pronounced it anyway). We’d spent the prior day driving to the peninsula, dodging snowflakes, and helping dig stranded Canadians (who should know better!) out of roadside ditches. But the weather gods smiled on us this morning, and I would say that our first sunrise was a harbinger of good fortune ahead. On this first morning I was still trying to wrap my head around a 10:30 a.m. sunrise (a brilliant idea that should be adapted worldwide) when we pulled up to Kirkjufellsfoss. (And just so we’re clear, the mountain is Kirkjufell, the waterfall is Kirkjufellsfoss.) I immediately recognized the scene, though in most of the images I’ve seen of Kirkjufellsfoss, the water was liquid and the surrounding landscape was green. Snow and ice dominated this morning, which I thought was pretty cool because it gave us the opportunity to capture the scene at least somewhat differently from the way it’s typically done. The biggest problem I had to deal with was working around the dozen or so other photographers, and waiting for selfie-wielding tourists to vacate the scene (thank you Content Aware Fill).